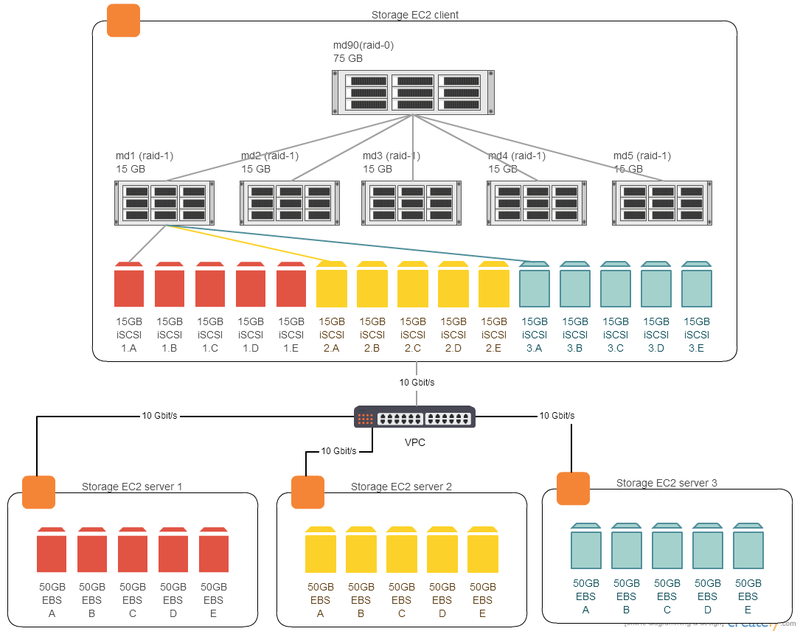 The question for today is – does Linux md-RAID scale to 10 Gbit/s? I wanted to build a proof of concept for a scalable, highly available, fault tolerant, distributed block storage, which utilizes commodity hardware, runs on a 10 Gigabit Ethernet network, and uses well-tested open-source technologies. This is a simplified version of Ceph. The only single point of failure in this cluster is the client itself, which is inevitable in any solution. Categories: Linux | Tags: 10 Gigabit, aws, dd, EBS, fio, iSCSI, Linux, mdadm, network, O_DIRECT, RAID, RAID-1E | Permalink. Amazon staff would have access to my data. A breach in Amazon’s systems would expose my data. A breach in my remote server OS would expose my data. One of the solutions which I considered was to encrypt my local file-system with eCryptfs but it has some issues with relatively long file names. Locally encrypted — all files which I store on the iSCSI volume are encrypted on my personal desktop, before being sent to the remote server. This ensures that the files cannot be read by anyone else. Secure — besides the local volume encryption, the whole communication is done over an SSH tunnel which secures the Internet point-to-point client-to-server communication. Remote — having a remote backup ensures that even if someone breached in my house and steals my laptop and my offline backup, I can still recover my data from the remote server. Furthermore, it is more convenient to frequently backup on a remote machine, because we have Internet access everywhere now. Note that remote backups are not a substitution for offline backups. Over Internet — very convenient. Of course, this backup scheme can be used in any TCP/IP network — private LAN, WAN, VPN networks, etc. ## You can now work on /mnt -- make a backup, copy files, etc. The Amazon AWS login credentials to start the EC2 backup instance. The root password for the EC2 backup instance, so that you can log in there and then access your backup data by mounting the encrypted iSCSI volume locally on the remote server. Make sure that you test if you can log in using an SSH client which does not have your SSH key and thus requires you to enter the root password manually. I do not consider password authentication for the root account to be a security threat here. The backup server is online only during the time a backup is being made, after which I shut it down in order to save money from Amazon AWS. Furthermore, the backup has a new IP address on each new EC2 machine start, so an attacker cannot continue a brute-force attack easily, even if they started it. Categories: Linux | Tags: aws, iSCSI, Linux, remote backup, TrueCrypt | Permalink. This article will demonstrate how to export a raw block storage device over Internet in a secure manner. Re-phrased this means that you can export a hard disk from a remote machine and use it on your local computer as it was a directly attached disk, thanks to iSCSI. Authentication and secure transport channel is provided by an SSH tunnel (more info). The setup has been tested on Ubuntu 11.10 Oneiric. Launch a Micro EC2 instance and then install Ubuntu server by clicking on the links in the Ubuntu EC2StartersGuide, section “Official Ubuntu Cloud Guest Amazon Machine Images (AMIs)”. Create an EBS volume in the same availability zone. Attach it to the EC2 instance as “/dev/sdf” (seen as “/dev/xvdf” in latest Ubuntu versions). (optionally) Allocate an Elastic IP address and associate it with the EC2 instance. Note that you can lower your AWS bill by buying a Reserved instance slot. Those slots are non-refundable and non-transferrable, so shop wisely. You can also stop the EC2 instance when you’re not using it and you won’t be billed for it but only for the allocated EBS volume storage. You can use any other dedicated or virtual server which you own and can access by IP. An Amazon AWS EC2 instance is given here only as an example. # Update your SSH key in ".ssh/authorized_keys", if needed. # and we access it only using an SSH tunnel. # leaving only SSH access (TCP port 22). The following commands show how to attach and detach a remote iSCSI volume on the client machine. The output of the commands is quoted with “#>>”. # The remote iSCSI volume is now available under /dev/sdb on our local machine. # You can use it as any other locally attached hard disk (block device). Once you have the iSCSI block device volume attached on your local computer, you can use it as you need, just like it was a normal hard disk. Only it will be slower because each I/O operation takes place over Internet. For example, you can locally encrypt the iSCSI volume with TrueCrypt, in order to prevent the administrators of the remote machine to be able to see your files. Categories: Linux | Tags: aws, client-server, iSCSI, iSCSI over SSH, Linux, SSH TUN tunnel, ubuntu | Permalink. If you allocate an Elastic IP address in the US-East region (N.Virginia), then sorry folks but you can’t use this IP address with an EC2 instance which is located in another region, say EU-West (Ireland) for example. No problem to remap it to an EC2 instance in another availability zone within the same region. Elastic IP addresses allow you to mask instance or Availability Zone failures by programmatically remapping your public IP addresses to any instance in your account. My inquiry about this in the AWS->EC2 forum. Categories: Linux | Tags: aws, ec2, elastic ip | Permalink.